We’d like to take this opportunity to again thank you all so much for caring for our father Giuseppe – you all make our life so much happier knowing that Dad is so well looked after! May God bless you all and give you peaces and joy! May you all have a wonderful and healthy New Year. What a pleasant surprise to hear from you again- and to be able to speak with Mum. We are happy for Mum that she is in a caring environment. Both Wally and Moya speak highly of the care that Mum receives at “Acacia” and how Mum values the friendship of the staff. We were very pleased to hear that Mum enjoyed the “Hillsong” concert recently; and let’s hope the weather starts to settle soon. With best wishes to you and all at “Acacia”. I wish to thank you and your staff for the care and attention given to my father during his three week of respite at Strathdale Centre, Strathfield. It is always very difficult to place close family members into residential care, but the professionalism and empathy shown right from the beginning was a great help. Your introduction to the Centre was friendly, with a tour of the ground floor and a choice of the room to be allocated. You explained procedures and answered questions freely. The staff who attended to my father were exceptional. They were friendly and nothing seemed to be too difficult. They handled my father gently and encouraged him at all times. The Diversional therapist involved him in activities and suggested that I bring in music tapes in Latvian so that he could listen to familiar music. This was done. He participated in other activities with the rest of the residents. He was encouraged by you to eat in the dining room with others•so that he would not be so isolated. Even though I visited twice a day I felt confident of the care that he was given. This was truly a respite period for myself and I will have no hesitation to use your facility in the future if needed. Dad never complained about the food. He ate absolutely everything and said how good it tasted. I also appreciate the advice given at the end of the respite as to how to care for my father. The cook showed me how to prepare thickened fluid so that it did hot lump and the nurses how to better assist him with mobility. The physiotherapist exercises we still do today. I again thank you for your care. My family and I would like to thank you very much for taking excellent care of my mother, Alexandra Gereis at your Strathdale Nursing Home facility. Aida, we extend our gratitude to you and every member of your staff for their professional and diligent help in caring for my mother’s needs, and pray that your lives and works be richly blessed. We again thank you for affording us a single room for mum’s last days. Mum, together with our family, enjoyed greatly the bright, breezy and open outlook of her room. We again thank you all for all your help during and after mum’s stay, and kindly ask if you can remember her in your prayers. I am writing to you to thank you and all of your staff at Strathdale, for the wonderful care and kindness you gave my Dad, Rex Ward. Dad went into Strathdale in March 2005, from memory it was 17th, St Patrick’s Day. I can honestly say it became his home for the past nearly 22 months. Aida there are too many names to thank and I am sure I would forget someone, so please pass on my sincere gratitude to all of those who looked after my Dad, on the ground floor. There was not one concern I had that was not answered and action taken. All the staff were caring, loving and dedicated in looking after a very important person to me. My Dad was the most wonderful husband, father and grandfather, he was the most gentle, caring, generous man you could have known. He was very special to me as a daughter and his little face use to light up when I walked into the room. He had a tough year as you know last year and fought so much, he up in Heaven now looking down on all of us, in no more pain or suffering at peace. I miss him so very much, but he will always be with me in my heart. I am grateful that he passed away in his own bed at Strathdale very peacefully in the end, and not in Concord Hospital, where he suffered many times before. Lorraine, you became a part of my family, I thank you from the bottom of my heart for your wonderful caring attention for my Dad and to all of you guys on the ground floor and of course Ray upstairs, thank you so much every one of you. You all know who you are, we got to know each other very well. No words can thank you enough from Pat, Ray and Gayle, Nicole and Dave, Renee, Alexis and Raymond we miss him, lots of love to yourself and all the staff at Strathdale. You are all very special. Thank you for all the care and attention given to Keith Balmer over the last three years. We feel Keith was well cared for in his individual needs, and treated with respect and dignity. We, his family, appreciated the communication between the staff and ourselves. I would like to compliment Virgil for his efforts in coaxing my Mother to participate in the weekly fitness classes and Bingo sessions- This was my request at a relatives’ residents meeting two months ago and it is so good to see my Mother being encouraged to come out of her room and have some interaction with the other residents. Previous diversional therapists had not succeeded in doing this with my Mother. Keep up with the good work, Virgil! And thanks for keeping the residents entertained. We would like to thank you and your staff for the kindness to Mum, most especially through her last days. We were greatly impressed with your staff- to many to mention them all- but a special thanks to Helder & Jenny for keeping in contact; Reg and Ava for always being there to help; and Keely for her dedication in Mum’s final hours. Keely’s explanation of the process of death did much to relieve the trauma for us. And also thank you to her for her compassion and kindness at the end. Thank you all at Willowood and God Bless. This is to thank you and your staff for the superb level of care that my mother Clarice Brunsden, received at Willowood. 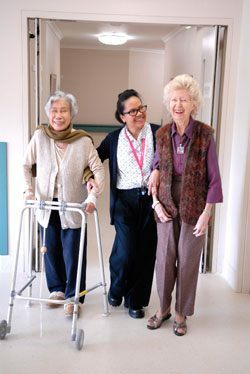 Though a resident only since October of 2011, she felt quite at home there, was not fussed over (which she hated) but was very quietly, attentively and professionally cared for by staff who treated her with dignity and respect. As her health failed and she became bed-ridden, her care continued with the same high standards and attention to her needs. I was pleased beyond words with how well Donna, Donna and everyone else treated Clarice without making her feel fussed over. I could not have asked for better care for Mum and was glad that when she passed, she did so at Willowood, where she felt safe and cared for by people who truly did care – not just as part of their jobs, but for her. you have my profound thanks and appreciation for all of your efforts on Mum’s behalf. I simply do not have the words to thank you enough. Thank you, Adriana and staff for giving relatives the opportunity to learn more about dementia residents. It was an informative meeting in very pleasant surroundings. The morning tea was delicious! The work you all do is greatly appreciated – so thank you. Firstly I would like to thank you for always making yourself available to discuss any query and actively dealing with it. It is a huge learning curve for someone like me and having you and your staff obliging and assisting with a smile, is very comforting. I’m sure, with experience you sometimes overlook the difference you all make not only to the residents but to their friends and family and I thank you. Thank you all for the wonderful care and kindness that you gave my mum during her time at Willowood. It was always a pleasure to assist her and to be greeted by a smile.